Bengaluru, Feb 14 (IANS) French aerospace major Dassault Aviation flew to India three Rafale fighters to participate in the 12th edition of Aero India 2019 air show from February 20-24, an official said on Thursday. 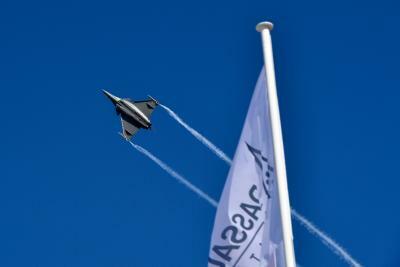 "Three Rafale aircraft have come on Wednesday to participate in the air show at our base here. Two of them will be on flying display and one on static display on the tarmac margins at the event," an IAF official told IANS. The biennial international expo is being held at the Yellahanka base of the Indian Air Force (IAF) near the Bengaluru international airport. The advanced fourth generation medium multi-role combat aircraft are in the service of French Air Force. "Two of them will fly for practice from Thursday to Sunday in the afternoon, for rehearsals on February 18-19 and for business visitors and public from February 20-24 before noon and afternoon," said a defence exhibition official. India is buying 36 of the twin-engine, delta wing multi-role Rafale to replace the ageing Russian-made MiG-21 fleet of the IAF over the next four years. Besides Rafale, military and civil aircraft of different types have flown into the city for the mega event from the world over, including the US. About 60 aerospace firms, including the state-run Hindustan Aeronautics Ltd (HAL), IAF, DRDO-ADA, Army Aviation, Airbus and Boeing will showcase their aircraft for flying and static display. Global aerospace majors, including, Boeing (US), Lockheed Martin Corp (US), Russian Aircraft Corp MiG (Russia) and Saab (Sweden), will be among the exhibitors at the event.